Most will remember Secret Service Agent Clint Hill from the hauntingly iconic photo of him climbing on the back of the Presidential Limousine in Dallas, that fateful November day, to lend assistance and protection to the First Lady, and sadly seconds too late, to President Kennedy. This is a riveting read and a unique panorama of three decades of history that wrought great change in America. Hill's personal accounts of five different Presidents, their families, lifestyle, personalities, challenges and travels are well worth the time! Clint Hill was a witness to so much history (and uses a ghostwriter), so it is a travesty that he makes that history so completely listless in this book. The text reads like a rundown of the official White House log of the President during those times that Hill was on duty. It appears that in trying to write this book, Hill used those logs to provide the bulk of his material. How much can one read about the date and time that the President traveled to certain places, that he was warmly received, and that the Secret Service was there (doing what in particular one does not know from this book)? This book makes high school history textbooks seem lively! There are no insights into the presidents but instead are laudatory tributes that have become cliche. Hill's unquestioning admiration for Eisenhower, for instance, makes the reader question whether or not Hill has at any time since 1960 contemplated the true success of the man as president (e.g., Eisenhower's focus on getting in his golf every day, his refusal to take on McCarthy, his refusal to address civil rights, his duplicity in promoting the U.S . as the moral center of the earth while spying on enemies and supporting dictators like Franco, the Shah of Iran, Batista, etc. The writing--whether Hill's or belonging to his collaborator--is completely lacking in energy, nuance, or self-reflection. It cannot be easy to describe working so closely (in terms of physical presence) to five modern U.S. Presidents and make it so boring. But this book certainly does. Four and one half stars.I have read Mr. Hill's previous book- Five Days in November and was fascinated by his eyewitness account of JFK's murder and the days that followed.This book repeats some of the same material, but most of his recollections are fresh and very insightful. Mr. Hill reveals the following truths about the Office of the President:There is no perfect individual who possesses every single characteristic to be in this position. Most have great qualities that enhance the position.All Presidents have enormous egos and their need for adulation and adoration can place them in very vulnerable and unsafe situations.Politics is dirty business and there can be some very dirty dealing going on - right out in the open, or behind closed doors.Mr. Hill and all Secret Service agents were paid a pittance for putting their lives on the line, leaving their families for 360 per year, and paying for their own accommodations when away from the White House. They deserve our humble appreciation and respect. If I had not lived through these presidential terms I would have not finished this book, as it is written as if it is a Secret Service report - flat. It gave me a behind the scenes look at events and daily happenings that I had followed in the newspapers, magazines and TV reports though so I stuck with it. If the writing flowed better or gave me a sense of feelings instead of doings, I would be reaching for his other books. It disappointments me to be saying I won't. This is the fascinating story of retired Secret Service agent Clint Hill. He is most remembered for being the man who climbed onto the back of John F. Kennedy's Presidential Limousine moments too late on November 22, 1963. The book is about as straightforward as it can get, chronologically providing a detailed overview of the ups and downs Clint faced while serving for five different presidents from 1958-1975. What made the reading experience fascinating for me was not only the historical moments he witnessed first hand but also the personal experiences he shared with some of the most prominent leaders in history. His closest relationships were with Kennedy and Johnson, due in part from his lower rank and limited time with Eisenhower and his assignment to the Vice President when Nixon took office. In comparison, it doesn't include much on Gerald Ford because Clint retired early on in Ford's term. Five Presidents made me feel exhausted at times simply from the amount of stress, traveling, and lack of sleep the USSS deals with on a daily basis. It also depicts how underpaid and underappreciated they are, putting others safety in front of their own and sacrificing so much of their personal lives. The most recognition they get is when something, often out of their control, goes wrong. The book covers key historic events from the perspective of someone working closely with U.S. leaders involved. Some of these include the U-2 incident, the Cuban Missile Crisis, the assassination and funeral of JFK, the 1960's Civil Rights Movement, the Vietnam War, Apollo 11, and Watergate. For anyone that has an interest in United States history, this is a breeze to read while still offering an informative and touching narrative. This is an excellent book with many auto biographical references and facts that have not been described in other references. This book read like a novel in that it was easy to understand and hard to put down. I read it in two days.I grew up in that era and like everyone else I had an awareness of the key events. I know exactly where I was and what I was doing when JFK was assassinated. I was never a big fan of LBJ and I was surprised about his passions and concerns for our country. I will read this book again. I really enjoyed this book.It was interesting to get a behind the scenes look at the way our President's life is guarded, and the sometimes foolhardy things the President does to put his own life in danger (ie JFK in 1963).I was amazed at the hard work Lyndon Johnson put it---of the 5 Presidents highlighted, he seemed to be the one that drove himself most to exhaustion.All 5 of them (Eisenhower, JFK, Johnson, Nixon, Ford) worked hard, but Johnson was really something else. Clint Hill has lived quite a life having experienced first hand what it is like to protect five of our country's presidents/vice presidents. I loved every moment of reading his memoir and was sad to see it end.I enjoyed his honesty, humor, and bluntness in this memoir. It was an engaging behind the scenes look at some of our nation's most well known history. Particularly touching were some of his personal memories. This book made me laugh and cry. Well done! This is a great chance for those of us who are so interested in American history to find out what presidents are really like. Clint Hill protected presidents from Eisenhower to Nixon. To find out what these men were really like and the sacrifices that were made to protect them is amazing. They were all so different from each other and these Secret Service men had to adjust to each man's needs and demands.Although I didn't select this book to read because of the current status of our president, the similarities between Nixon's problems and Trump's problems are shockingly similar. I am not a history buff, but I have found this very interesting and can't wait to read Mrs. Kennedy and me. Mr. Hill encapsulated history he lived and protected through the existence of 5 American Presidents. This is a compelling read for anyone interested in Presidential History. On this, the eve of the election of 2016 I was determined to attempt to read one book apolitical in nature; but, one that also captured the moral ethics of what it means to be a "diligent servant of the people". Mr. Hill is to American History most notable for his attempted protection of First Lady Jackie Kennedy on that fateful day of 22 November 1963; and, yet in this book we see so much more to the man who attempted to maintain a quiet presence in the backdrops during some of the most heated moments of the Cold War and other events to include the tragedy of the JFK assassination.Outside of the Mike Wallace interview of 1975 - Mr. Hill never spoke of the assassination of President Kennedy. The interview was conducted after he was forced to medically retire. True to himself and humble for person he is, his confidence and abilities as a written account to this memoir and history of the same are second to none. Mr. Hill represents what truly good Federal Employees do for their country on a daily basis. Where society (generally speaking) jokes about those in public service as somehow "gaining" and being "lazy" - Mr. Hill's efforts in his career and efforts displays a true presence of mind and shows that myths are to be debunked through actions. He never mentions this sort of societal disgruntlement in his book - he shares the professional and apolitical efforts of a job that needed (and still needs) to be done and accomplished in an apolitical manner. When Mr. Hill was a Secret Service Agent the Agency fell under the Department of the Treasury; Post 9/11 the Agency today is a part of the Department of Homeland Security. Many of us in the Department of Homeland Security do many things quietly to ensure the safety of the public and the sovereignty of the United States continues. I will not print here the tragedies that changed the last half of the 20th century; I will say that from the time Mr. Hill became a Secret Service Agent during the Eisenhower years to the time he was forced to medically retire during the tenure of President Ford's Administration that globally we witness the love people had for Ike and the USA had all but disappeared by the time we get to the era of President Ford.If you are looking for an apolitical book in this day and age of pure craziness, and you have an interest in American Leadership - this book will give you a birds eye view of the realities behind the scenes. Outside of the Department of Defense there are many Federal Departments - persons who work diligently, keep faith, struggle on, and see things that never make the news and they themselves are rarely thanked if ever - these men and women will not become President - they merely do what they believe and do it with a conscience of tax payers efforts to invest in their Government. 21st century Politicians should take note and nay sayers should beware. This book is a quick interesting read. While most know Clint Hill for his heroic efforts to reach and save JFK by climbing on the back of the limo during the assassination, most don't know about his service to 4 other presidents. By serving on the details of Ike, JFK,/Jackie, LBJ and administrating PPD for Nixon and Ford, Hill was on the front row witnessing some of the most tumultuous times in postwar America. Hill gives respectful presentations of the five presidents, their quirks and strengths. He also offers insight into the historical times, events, and ramifications of their decision. The chapter on LBJ and his travel and demeanor are worth the cost of the book. This is an autobiographical depiction of Clint Hill's career as a member of the United States Secret Service Presidential Protection Detail. As the title suggests his service tenure included working with Presidents Eisenhower, Kennedy, Johnson, Nixon and Ford. For those of you who have seen the news film covering the assassination of President Kennedy, Clint Hill is the Secret Service agent seen climbing up on the back of the presidential limousine in an attempt to cover the bodies of President and Mrs. Kennedy with his own. This is a very interesting book and it gives the reader a good feel for life in the oval office, White House in general and other venues. I really loved this book! Clint Hill is the Secret Service Agent who helped Jackie get off the trunk and back into the car when JFK was shot. He was forever changed by that day. It was fascinating to read about his experiences with 5 different Presidents and his role in the Secret Service with each of them. He gave up so much of his own life to serve our leaders. He witnessed so much history.This isn't a juicy tell-all kind of book, this is a first person accounting of what it was like to be serving and protecting the various Presidents and their families. I've already purchased his other two books and I can't wait to read them! (2 1/2). This is a longish, 20+ year history lesson with lots of insights. Clint Hill is now on his third book capitalizing on his time as a Secret Service agent. When he gives us the logistics, the inside scoop, the personal touches that he or others had with people they were protecting this book is terrific. But unfortunately, a fair amount of it is just recounting the actual events of the day, and that is old news and can get tedious. It was great to revisit some of the events and certainly a reasonable read. This is my first book by Clint Hill. It was interesting and it is amazing the events that he witnessed. The assasination details are what you would expect but it was all the other things he witnessed that made this so interesting. It was a little slow when he talked about all the traveling. Not necessarily the places but every crownd was enormous and dangerous. It was just a bit repetitive. Full review after my book club discussion with The Wards. Absolutely give this book 5 stars. The perspective of the author gives us an inside view of the presidency, politics and an amazing period of American History. I would not recommend if you have any background in history. Very basic information and I learned nothing new. One beautifully written book that describes CLINT HILL's life as a Secret Service agent during the years of 5 different presidents. His personal life was sacrificed, his professional life was draining and challenging, his career was filled with memorable moments and we owe a debt of gratitude to his commitment and determination. It was so easy to read - you felt like you were right there with him. I imagine a lot of the word-crafting of the book is credited to his co-author, Lisa McCubbin. Cheers to her!I really couldn't put this book down and hated when it was over. So interesting to learn about the similarities and differences between these five presidents. They all loved golf. Most, if not all had a "White House" away from the "White House", which was their home. Johnson spent close to 1/3 of a year at his "away White House" in Texas. I'm certain there are many indiscretions that Clint Hill witnessed and actions that he disagreed with, but the book didn't share any of that. He was 100% respectful of the men he described and didn't try to belittle, question or leave the reader with ill feelings about any of our Leaders. Clint Hill realized the pressure that each Leader was under. He also suffered personally from the fateful day when President Kennedy was assassinated, which he has carried throughout his lifetime.High praise for this book AND his first book, which I also read and loved - "MRS KENNEDY AND ME". An entertaining read that I found educational, but ultimately lacking in emotion. I'll admit near the end that I skimmed any descriptions of overseas trips because they were all so similar. What this book does well is lay bare the personality differences between each of the Presidents Hill served under, particularly Eisenhower, Kennedy, and Johnson. The running theme throughout the last 2/3 of the book is the extent to which Mr. Hill was affected by the assassination of JFK, which provides a nice touchstone that readers can keep coming back to. What it doesn't do well is infuse any scene, any conversation, any memory with any real emotion. I assume this is stoicism on the part of the author, and I totally get it. But it's kind of odd to hear about troubles at home and confessions about PTSD mentioned in passing. Similarly, there is a lack of detail in the descriptions of even the most memorable events. Think of a friend describing his last vacation to you; that's how this whole book reads. Still, I'm going through a phase of fascination with American presidents and it was fun to read about 5 of them in rapid-fire succession. The largely unobserved place in history occupied by the Secret Service is an interesting lens through which to view the presidency and I'm grateful for Mr. Hill's perspective, even if it isn't as rich as I'd prefer (hey, I'm Norwegian too. I totally get it). As a child of the early 80s I was vaguely familiar with the difficult decades prior to the 1980s. My perception however was just what I had put together.As an adult I was fascinated to hear of this agent's first-hand accounts of these important current events. Bay of Pigs, the Cuban Missile Crisis, JFKs assassination, VP Spiro Agnew (who I knew very little of), Vietnam, and Watergate were all crammed into this agents time with the Secret Service.If you like history, presidents, or the Secret Service you'll like this book. At times it seemed like the same accounts of traveling abroad, but each president had a chapter that was enlightening. The years that Mr. Hill protected the presidents are the years that historically intrigue me. It's my life's mission to continue to study those years from many angles. Although being a Secret Service agent 24/7 is not my dream job, I envy Clint for his unique opportunity to witness some of the pivotal moments in the twentieth century- U2 Incident with Eisenhower, Cuban Missile Crisis during with J. F. Kennedy, Martin Luther King, Apollo 11, Watergate, Vietnam War spanning five presidency, etc. I learned a lot about America's history of that period. It is definitely recommended. Fascinating read behind the scenes of 5 presidents. One president really was crazy, all were unique with personalities that show how this tremendous job and the weight of the world effected not only the presidents but the people protecting them. You could see Clint Hills marriage begin to crumble almost from the start. The hours and duties of those behind the scenes and their sacrifices should humble every American. What a fascinating book from former Secret Service agent Clint Hill. It was an in-depth look at how the SS operated. What a difference from the very small force as a whole with Eisenhower, to a burst of new agents and procedures and continually expanding necessities since the Kennedy assassination. I really enjoyed the details of travel and advance work that the agents did to protect the lives of their charges, and also the look at the character and personality of the presidents. Un pezzo di storia che sembra meno conosciuta, ma la figura di Clint Hill l'abbiamo tutti impressa nella mente, se solo una volta abbiamo visto la scena dell'assassinio di Kennedy.Un libro molto interessante. 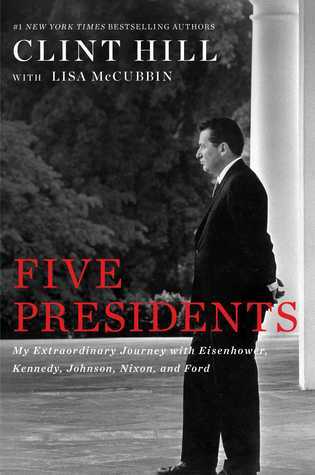 Five Presidents, My Extraordinary Journey with Eisenhower, Kennedy, Johnson, Nixon and Ford by Clint Hill with Lisa McCubbin is a fascinating read. Clint Hill served as a secret service agent for five presidents. He was present at the motorcade when Kennedy was assassinated, and then served on protection duty for Jacqueline Kennedy and the family for a year. This memoir was similar to many others as it too frequently name-drops and promotes all of the achievements of the author. The only other negative about the book was the end of the story seemed very abrupt and hurried. Otherwise, the book was very attention-grabbing. Clint Hill truly gave us insights to the personalities of the presidents, something that we rarely got to see in the past. This book is appealing to anyone. I will be reading Mr. Hill’s previous book, Mrs. Kennedy and Me. This Is an amazing book about former Secret Service Agent Clint Hill and his incredible journey as an agent for five presidents: Eisenhower, Kennedy, Johnson, Nixon, and Ford. The book promises to deliver an inside look at being a secret service agent. The book definitely delivers, the book shows the good and bad of being a secret service agent. It also provides a unique window into the lives of some of our contemporary presidents.The book opens with Hill talking about where he grew up and his childhood, high school, and university years. He lived a very simple life. He was born on January 4th, 1932, and he was adopted when he was an infant. He grew up in the small town of Washburn, North Dakota. He graduated from Concordia College in Moorhead Minnesota. He planned to be a sports coach and history teacher. But, he was drafted into the Army. He also talks about his life before he was a secret agent. Hill then shares how he got started in the secret service. He saw some of the secret service agents protecting President Eisenhower and he loved their professionalism. He decided to apply to the secret service. The secret service rarely has any openings but, three secret service agents retired at the same time. So, he got the job.The book offers information on all the five presidents Hill helped to protect. The one character that stood out was Lyndon B. Johnson, this is because he was extremely energetic and he yelled at other politicians and administration official often, giving them the “Johnson Treatment”. The book shows how each President had their own personality. Eisenhower was the always on time, hardworking general. Kennedy was the charismatic youngster. Johnson was the energetic Texan. Nixon was the sneaky one. Ford was the relaxed and simple Midwestern man. The book was was written like the author was telling a story, although he was extremely detailed. My favorite part of the book was the Kennedy assassination because he was incredibly detailed. He also gave his opinion on who was the one who shot JFK. He said this was Lee Harvey Oswald and that he does not believe the “magic bullet” theory. My least favorite part of the book was that. I felt that the author rushed through. If I would change something it would be that the writer mentions his other books too much. For example, sometimes in the book he would say I talk more about this book in my other books Mrs. Kennedy and Me and Five Days in November. There are photos in the books and they help show Clint Hill’s time as a member of the Secret Service. The book documents that there are are many negative aspects to the life of a secret service agent. The obvious one is that it takes up a lot of your time. Clint Hill stated in the book that was home for the night one out of ten nights on average. Also, being a secret service agent made him travel a lot and this caused him to miss out on his children growing up. Also, the job is extremely dangerous because one has to sacrifice their life for the President’s. In fact, Clint Hill almost died during the Kennedy Assassination. Because of this, the author shares his battle with PTSD after the Kennedy assassination. This is something more often discussed in books about veterans returning from wars and not regarding secret service agents. The author is extremely qualified to write the book because the book is about himself, even though he does get some assistance from another author. The book had a reflective tone, as the author reflected his choices and the good and bad of being a secret service agent. Even though he talks about his secret service life he did not expose any government secret and it was not a book about gossip. I would highly recommend this book for anyone who likes politics, history, or presidential history. If one do not like any of these topics then the book can be a bit slow at times but I still recommend it. But, one might not like it as much. If there exists a list of careers where obscurity is a goal, a career in which you are overworked and underpaid, a career where you literally place your life on the line for someone on a daily basis and are only recognized when you fail at this, the government Secret Service detail will likely be near the top. Five Presidents is the story of Secret Service agent Clint Hill's journey through the system, taking part it its evolution and experiencing both joys and pains, all with a front row view of some of the most eventful times in America's recent history.But despite serving five very different heads of state, Hill presents himself as a figure not too different from Forest Gump, not in a simpleton sense, but in that he didn't let politics, prestige, or personality differences get in the way of his primary goal of faithfully serving the President (or vice-President or First Family). Hill gives further examples of humble leadership in sharing his thoughts about serving as Jackie Kennedy's detail and Spiro Agnew's detail (both considered a step back having previously served Presidents Eisenhower and Johnson, respectively). In both cases, Hill never lets dreams of upward mobility affect his performance, and in the case of Vice President Agnew, sees it as an opportunity to increase his leadership and make reforms to the organization. And while Hill never complained about constantly being taken for granted, he shares of how President Johnson, who at one point wanted him off his detail, eventually recognizes his tireless work and increased his pay grade.The book is also an intimate portrait of five very different presidents. While they all craved the cheering crowds (Hill describes them as having various levels of ego problems), they all had different personalities, from Eisenhower's military-style regimen to Kennedy's charismatic personality, to Johnson's somewhat risky spontaneity. It's a reminder that these five men were human and made mistakes, faced hardship, but deeply loved their country. And like any new job, Hill and the Secret Service were always able to adapt admirably.While Agent Hill was far from perfect, and the responsibilities of the job took a significant physical, mental, and emotional toll on his life, we should all strive to exhibit this same kind of humble leadership, whether we be skilled laborer, a Secret Service agent, or even President of the United States.